The ideal spring break is generally catching some rays on a beach and sipping cocktails, right? However, not everyone can afford to jet off to the beach. Although I will actually be heading on a beach vacation during my spring break (it's in April, so I still have quite a bit longer to wait! ), I generally spend spring break at home, so I can totally relate with just spending a relaxing break at home instead of on the beach. These are some ideas for things to do during spring break at home. Polish up on your photography skills. Everyone loves a good Instagram picture, right? Use this free time to polish up on your photography skills by gathering your friends that are also on a stay-cation and going on a photo adventure to take some awesome pictures and also work on your photography skills. Fiddle around with aperture, shutter speed, ISO, whatever, until you get the perfect photo! I'll be completely honest and say that I've never been good at unplugging. I don't think that any bloggers really are. I'd really like to take some time to unplug sometime but I'm always so connected to the internet. It feels boring to not have it. So maybe unplugging for the whole break is a little unreasonable, but unplug for an hour, a day, a couple days, however long you think that you can handle. You'd be amazed at what you can do when you put your phone down. Not to mention, you don't have to feel envious of all your friends on social media posting about their beach vacations. I tend to always get books and then never get around to reading them. In this day and age, reading is becoming more and more ancient, or maybe it's just me getting older and busier. The thing is, we're constantly filled with things to do and reading is definitely not our top priority. Take this time to sit down and cozy up with a good book. So maybe your friends might come back from spring break gushing about how much fun they had on whatever beach, but you can come back from break and demonstrate a new skill that you've learned over the break. There are so many things that I want to learn that I just have never gotten around to and this is your chance! Pull out those YouTube tutorials and get onto Google. With all this modern technology, teaching yourself a new skill can be done with just a click of a button. Fun fact, I actually learned how to design a website and also knit with just the help of online tutorials! Over my last break, I had a blast pulling out my acrylic paints and painting away (you might have seen them on Snapchat) and it was just so relaxing. Whether you're more into drawing or DIYs or even an adult coloring book, channel your creativity and create a work of art. The best thing about this is that it's so relaxing and refreshing, but you also get a fantastic art piece at the end of it. If just creating art is a little dull for you, sometimes I like to put on some Netflix to half-halfheartedly watch (it's best to put on a favorite that you've already seen so that it's not too distracting) or put on some music. I couldn't be a true blogger if I didn't include brunching during spring break. Find a brunch place that you haven't tried out yet and make a visit there during break! It doesn't matter if you already have an all-time favorite brunch place, because you never know, you might just find a new favorite place to sip lattes and eat waffles. 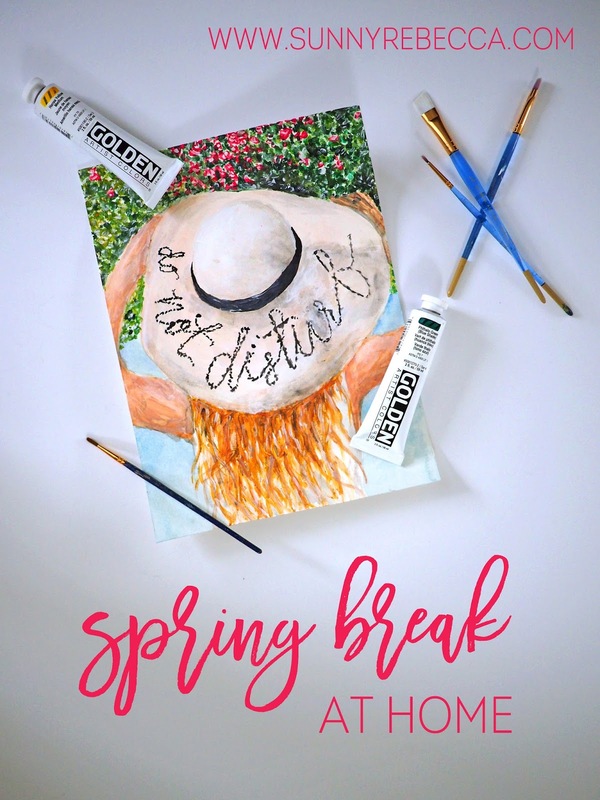 This post is in collaboration with the spring break link up hosted by the lovely, Olivia. That's a fantastic idea- brunching! Definitely will do that!! Looking forward to future posts, Rebecca! Loving this post, Rebecca! I've been wanting to go get brunch for so long - maybe I can finally do it this spring break! Also, I'm completely obsessed with your art. You're so talented! !